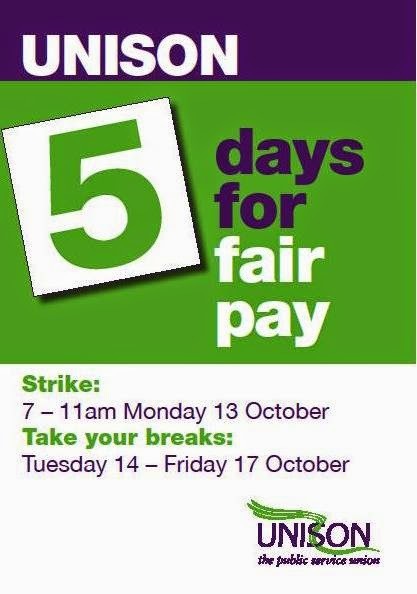 This morning UNISON and other union health workers will be out on strike in England. For the first time in their history midwifes will also be on strike. The last such dispute on pay was over 30 years ago. Urgent and emergency care will still be provided. The government is refusing to implement the independent pay review body award of 1% while at the same time increasing the pay of MP's by 11%. It will not talk to the trade unions. Pay for the last 5 years has been below inflation so this means in real terms a massive pay cut for NHS staff. The lowest paid such as Band 1 hospital porters have lost £1,387 and this year another £347. Over the weekend we heard that 20% of NHS staff have to work a second job in order to survive and 13% depend on payday loans. By coincidence on BBC news today they reported that the directors of the top FT100 companies now earn 120 times average earnings. This is £2.3 million each per year. In 2000 they use to receive only 47 times the average. I note that they used the figure of average earnings as £27,000 per year. 25% of NHS staff earn less than £21,000. It is growing pay inequality in this country that is driving not only poverty and food banks but disillusionment, distrust and fear in modern British politics.